A film by Thomas Wiewandt / TMA Member and Supporter! An immersive multimedia experience with no narration, a creative blend of HD video footage, time-lapse imagery, stills, natural sounds, and "organic music" performed by world-class musician Gary Stroutsos. 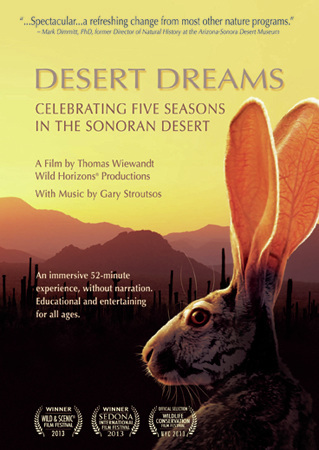 This pictorial and musical chronicle of 5 seasons in Sonoran Desert lowlands of the American Southwest and northwestern Mexico showcases weather phenomena and 182 species of plants and animals. Purchase online through the Wild Horizons website or by mail. Checks preferred, made payable to Wild Horizons.